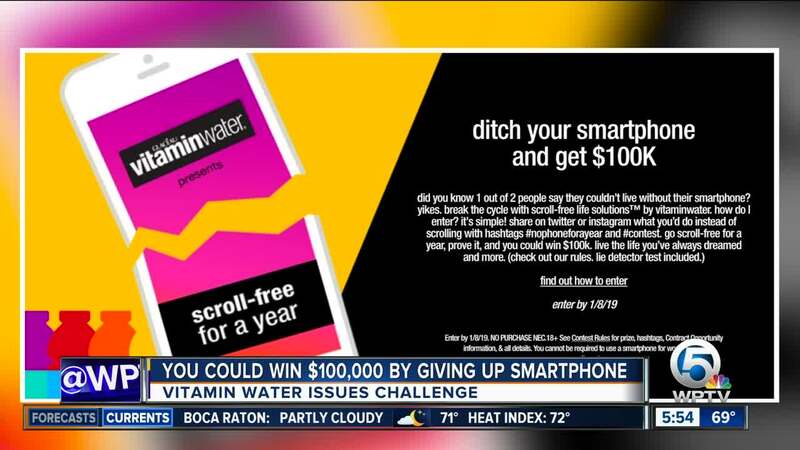 Vitamin Water unveiled a challenge inviting anyone to “break the cycle with scroll-free life solutions” for 365 days for a chance to win $100,000. Many of us can’t go a few seconds without checking our smartphone. Do you think you could last a whole year?! Vitaminwater unveiled a challenge inviting anyone to “break the cycle with scroll-free life solutions” for 365 days for a chance to win $100,000. “This means you may not physically operate, caress, hug or otherwise be physically affectionate with anyone’s smartphone,” the company said on its website. Those interested in the challenge can enter by creating a Twitter or Instagram post but make sure to include hashtags #nophoneforayear and #contest. Laptops, destktop computers are OK to use. Voice activated devices are also OK.
You have until Jan. 8, 2019 to enter. Vitaminwater said they will pick a winner on or around Jan. 22. Click here for a full list of rules.